Army Truck pattern is half solid green and half solid white with red stripes. #153 - 4 inch salmon hoochie made by Supertackle. 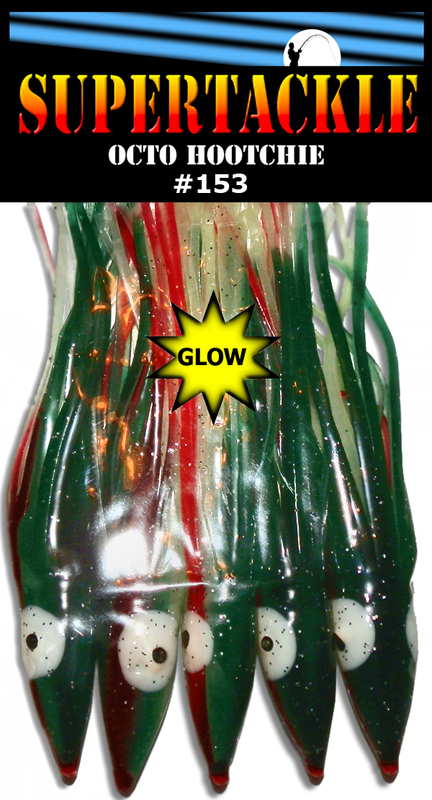 Soft plastic, hollow tube type, artificial fishing bait. Our 4" model has a wider than normal head diameter profile to accommodate many of the standard lead jig heads on the market. These can also be rigged for trolling as a hootchie for sport or commercial salmon fishing. Also commonly used as an Ichuchu skirt in the Mediterranean for ground fish jigging. Phone in an order or pay with a credit card.